The Isolated Inverter Platform is a rapid development system for hardware and/or software development in three-phase inverter applications, with a particular focus on motor control. Flexible evaluation of ADI isolation technology in a highly configurable system-oriented platform is enabled with multiple test-points, and connectivity options. An easy-plug connector allows controller connection to an ADSP-CM408 processor evaluation board, while additional 0.1” headers enable alternative connectivity to other processor or FPGA platforms. The benefits of ADI isolated sigma-delta converters for voltage and current measurement, isolated gate drivers, and power controllers can be explored in a full system application at dc bus levels up to 800V. The isolated inverter platform is a power board that runs from a dc input and provides a three-phase variable frequency, variable voltage, and variable dead-time PWM output to a three-phase motor or load. The inverter is provided as an open loop platform with no feedback loops – however these can be added by the application developer. Isolated current and voltage feedback are provided to the control side of the board via sigma-delta modulators, and these can be used for development of sensor-less control algorithms. The inverter is made up of a three-phase six-IGBT bridge, with the IGBTs rated at 1200V and driven by three dual isolated gate drivers. A DC – rather than AC- input is provided to allow flexibility on the dc bus voltage level (rather than it being limited to the ac line peak). 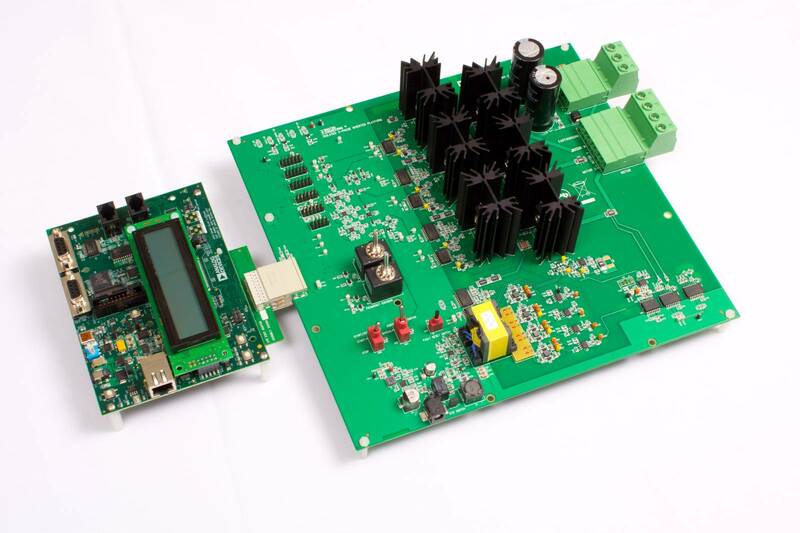 The board is optimized to work from a DC supply in the range 24Vdc-800Vdc. The power rating of the supply should be sufficient to match the load being driven. The power board is rated up to 2kVA without forced air cooling. Additional power throughput can be achieved with fan cooling added. A series connected diode implements a half-wave rectifier at the input, so if needed, the power board can be driven from an AC supply. However output power is limited in this case. If a full AC front-end is required, the inverter platform can be utilized in conjunction with the ADP1047 evaluation board up to 300W, or the ADP1048 evaluation board up to 600W. An isolated I2C interface is provided on the inverter board so that the ADP104x evaluation board can be easily controlled by the same processor/FPGA interface. The inverter kit has the hardware and software required to spin a three-phase motor under open loop speed control in conjunction with an ADSP-CM408 EZ Kit (orderable separately). The demo software is provided as an executable file which can be flashed to the ADSP-CM408 processor using the ADI serial boot-loader utility. A .NET-based graphical user interface (GUI) is provided to enable motor start-stop, open loop Volts/Hertz speed control, and data visualization. This development platform can be purchased from ADI here. This FAQ provides guidance on how to get the platform up and running and how to download the required demo software. The board schematic, bill of materials and design files are included as attachments to this post.